Mililani senior Britney Stephens is focused on "just track, track, track"
Four years ago, Britney Stephens found her niche at precisely the right time for the Mililani track and field team. As it happened, she turned out to be pretty good at it. "I would always try things, like all your friends are just starting to get into soccer," the Mililani senior said. "But I wasn't really into the whole soccer thing. I guess I wasn't coordinated. I can't run and kick a ball." So, she basically took the ball out of the equation, and became a vital cog in Mililani's sustained Oahu Interscholastic Association track success as one of the state's top sprinters. Whether it's participating in her uncle Mel deLaura's Hawaii speed and quickness camp over the summer, her multi-weekly weightlifting sessions in her garage with her father, Travis, or lengthy runs at Central Oahu Regional Park, Stephens intends to use every avenue at her disposal to shave more fractions of a second off her already-formidable times in the 100- and 200-meter dashes for the upcoming OIA and state meets. Mililani senior Britney Stephens had no second thoughts about missing her junior prom last year in favor of the Oahu Interscholastic Association West track and field championships. The talented sprinter is going to miss the Trojans' senior prom to focus on track again -- and this time, there isn't even a meet on the same week. It's a choice that many other high school girls might question. "(Last year) after I found out that prom and (the meet) were the same day ... I planned that I wasn't going," Stephens -- pronounced Stefens -- said. "I don't think I regretted it. I was really happy with my speed then, and I would have hated to go to prom and gotten sick or something, and maybe not have done as well. "I'm sure prom would have been fun, but I'm happy with my decision. No regrets." It's that level of commitment and focus that helped Stephens and her teammates capture yet another girls OIA title last season -- the team's third in five years -- and propelled her to a first-place finish in the state 200-meter dash at 26.20 seconds. With the prom sandwiched between this week's OIA championships and the states later this month, Stephens has her race face on, and no amount of dance invitations or dreams of limousines will dissuade her. Laughter and smiles come easily to the lean 18-year-old, but she's all business on the track. By all accounts, Stephens is in a privileged position to threaten the state marks in the 100 dash (12.1 seconds hand-timed, 12.25 electronic) and the 200, her favorite race (25.04) after another devoted summer of structured workouts, and so far, a successful season. She also anchors Mililani's 4x100 and 4x400 relay teams. Sixth-year Mililani girls track coach Dane Matsunaga calls Stephens the best sprinter he has ever coached. "She never brags or looks for the spotlight," he said. In the Honolulu Marathon Invitational track meet last month at Kaiser, Matsunaga said Stephens ran a 12.17 in the 100 and 25-flat in the 200, although those times were wind-aided. 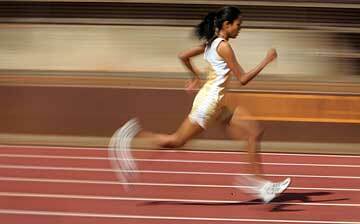 "Sprinters, a lot of times when they have talent, they might not have drive because they are so good," he said. "They've been good, so they don't feel the need to improve. But for her, she's never settled for the state that she's at. She always wanted to get better and get better. I really appreciate her accepting the things we want to do for her, building her strength, her endurance. Whatever it was, she's accepted it. Never asked any questions, never complained. I'll probably miss that -- a lot." Not much of the outdoors type as a child, Stephens' only other real athletic activity was brief, to say the least. "I tried ballet for one year, did one rehearsal and I was like, no," she said. "I did a really small basketball kind of thing, but no, that wasn't going to work. I was a real girly girl, I didn't want to go out and play. I was just a big dork, kind of watch TV, kind of a couch potato." 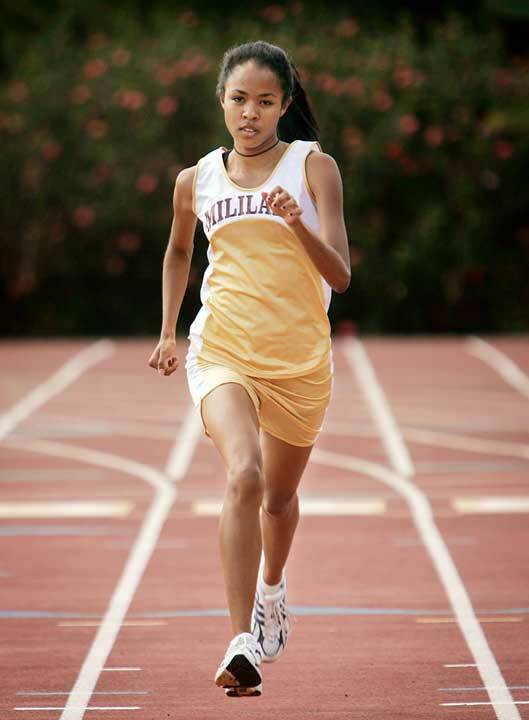 In the eighth grade at Mililani Middle School, she tried track with some friends as a fun thing to do. To Matsunaga's delight, Stephens took to it by her freshman year and was already challenging state qualification times. Stephens plans to run track on an academic/athletic scholarship at NCAA Division II Eastern New Mexico University in the fall. As one of the Trojans' four co-captains, her leadership qualities are on display to her younger teammates. Stephens took sophomore Leiann Chun under her wing and helps her during practice. 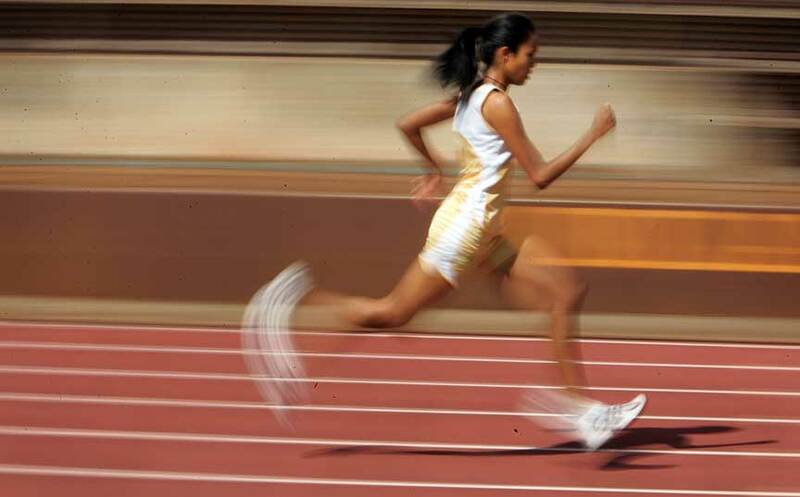 "She helped me with my starting block and working on my form when I run," Chun said. "We do relay shifts together, like work on our baton passes. She always tries her best, always works hard, and she pushes me to work harder." Besides the occasional book on Egyptian lore, right now it's all "just track, track, track" for Stephens. As part of her health precautions leading up to the OIA and state meets, she's drinking "like, crazy amounts of orange juice" and curtailing her regimen of weight training and running. Matsunaga credits Stephens' parents, Travis and Dale, with assisting in her arduous routine away from school. They helped convert their garage into a weight center, and either parent regularly drives their only child to Central Oahu Regional Park. Travis Stephens, a defense attorney and former basketball player at Chaminade, was a sprinter on the 1976 Leilehua team that won the state team track title. He often goes running with his daughter to keep her company -- and stay somewhat in shape himself. "She was probably more focused than I was," he said with a laugh. "I don't know if anyone works harder than she does. I would be surprised ... she's very, very religious about what she needs to do."